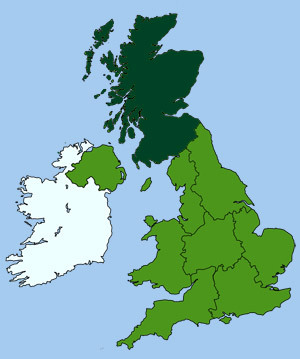 North East Scotland contains the counties of Aberdeenshire, Moray and the Cairngorms National Park. This area is dotted with famous castles such as Blair, Braemar, Corgarff and Victoria's Royal Balmoral. 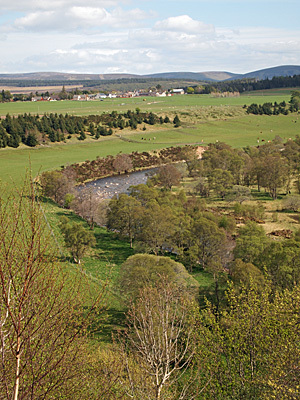 Many fine malt whisky distilleries can also be found along the River Spey in Moray. The Cairngorm mountain range includes the Cairngorms National Park and the extensive remnants of the ancient Great Caledonian Forest. The Cairngorms form the largest National Park in the UK, covering some 4,500 square km of dramatic and unspoilt countryside. The Park offers a wide range of facilities and attractions, from castles, whisky distilleries and waymarked trails to adventure parks and extreme outdoor sports. In particular, the area near Aviemore is now Britain's principal winter sports region. Aberdeenshire: Aberdeen, Ellon, Fraserburgh, Huntley, Inverurie, Peterhead. Moray: Elgin, Fochabers, Forres, Rothes, Lossiemouth.